I was born in raised in Bakersfield, California. 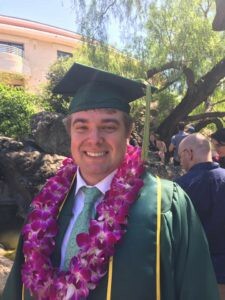 I went to college at California Polytechnic State University of San Luis Obispo and received my Bachelor’s of Science in Kinesiology, my Mild/Moderate Special Education Credential, and my Master’s in Special Education. I am Autism Certified and have my First Aid/CPR/AED Certification for Adults, Children, and Infants. I graduated with my Master’s this last summer, and this will be my first year as a teacher. Although this is my first year, I have the energy, passion, knowledge, and experience to be an effective educator. I have worked in a Physical Therapy Clinic for 2 years as well as a private Special Education Clinic for another two years. Growing up I loved getting involved with sports in any way, whether it was organized sports, getting friends together to play, or just watching. Growing up I played club soccer year round, high school football, soccer, baseball, tennis, and swimming. I also enjoyed competing some summers in wake board competitions and got involved with MMA in college. My family is from Wisconsin so I was raised a Packer fan and love every second of football season. I am currently the Cross Country Coach at TJ High School. I arrived in Colorado on July 24th and have loved getting to explore this beautiful state with my dog. I look forward to making a difference at TJ High School and making this my new home.